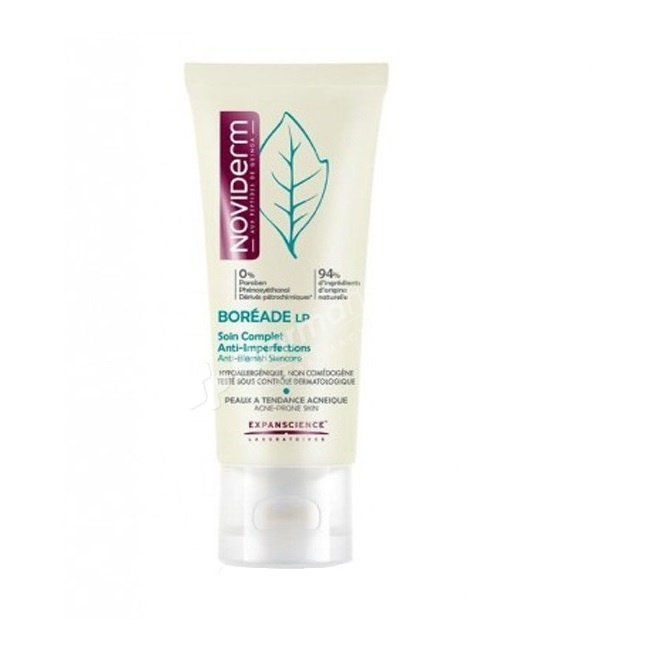 Noviderm Boréade LP Anti-Blemish Skincare corrects severe blemishes and limits their recurrence. Moisturises the skin thanks to glycerine. Speeds up the elimination of superficial inflammatory and comedonal lesions thanks to lupin peptides, known for their soothing and anti-irritant action. Improves skin texture thanks to salicylic acid, AHAs and prolonged release AHAs, known for their exfoliating action. Prevents the appearance of blemishes thanks to a complex of matifying (5 α avocuta), astringent (zinc gluconate) and purifying (capryloyl glycine) active ingredients. Soothes and restructures the skin thanks to quinoa peptides. Even the most severe blemishes are corrected. Their recurrence is limited. Your skin is cleansed without dryness and it is more even-textured. Apply morning and evening to your clean and dry face avoiding the eye contour, ideally for 2 months for optimum results. When applying the product, you may feel a slight stinging sensation. This sensation is associated with the product's activity and is temporary. Aqua (Water), Lactic Acid, Lactic Acid, Arginine, Glycerin, Caprylic / Capric Triglyceride, Oryza Sativa (Rice) Starch, Cetearyl Alcohol, Butyl Avocadate (5 Avocuta Α), Hydrogenated Palm Kernel Glycerides, Hydrogenated Palm Glycerides, Glycerin, Lauryl Glucoside, Polyglyceryl-2 Dipolyhydroxystearate, Dicaprylyl Carbonate, Silica, Zinc Gluconate, Sodium Stearoyl Glutamate, Xanthan Gum, Sclerotium Gum, Glyceryl Caprylate, Hydrolyzed Lupine Protein, Hydrolyzed Chenopodium Quinoa Seed, Maltodextrin (Quinoa Peptides), Sodium Cocoyl Glutamate, Disodium Cocoyl Glutamate, Propyl Gallate, Sodium Hydroxide, Salicylic Acid, Pentaerythrityl Distearate: Consistency Factor, Capryloyl Glycine, Fragrance. During the period of use, avoid sunlight or use suitable protection because of the risk of increased skin sensitivity to UV rays when using products containing AHAs.